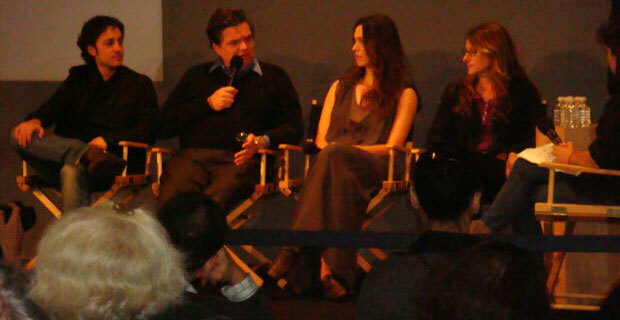 Oliver Platt holds court at the Apple Store. One of the great things about the Tribeca Film Festival is that most of the movies in the lineup aren’t bloated studio blockbusters with millions of dollars of marketing budget to burn (tough break, Michael Bay). They’re smaller independent films that rely on word of mouth and dedicated tub-thumping stars to get the buzz going, which ultimately results in cool events where said tub-thumping stars mingle with the public and promote the everliving crap out of their movie. That’s exactly what happened at the Apple Store in SoHo last night, as recognizable actors Oliver Platt (A Time to Kill), Rebecca Hall (Vicky Cristina Barcelona), Thomas Ian Nicholas (American Pie) and acclaimed writer-director Nicole Holofcener (Friends With Money) gathered to chat about their new flick, Please Give, as part of TFF’s “Meet the Filmmakers” series.